just after the nuclear disaster in Japan. Women with a family history of ovarian or breast cancer should read this article very carefully. Low levels of radiation are significant. People who have any predisposition to cancer have more cancers if they are exposed to radiation—even low levels of radiation. In the United States and elsewhere, medical testing is loaded with huge amounts of radiation. In Japan this week, authorities were concerned when the reading reached 400 millisieverts (mSv) of radiation. To compare, a routine Chest CT for a coronary heart angiogram typically delivers 16 millisieverts of radiation. A CT of the abdomen and pelvis is 10-13 mSv. In fact, the average dose experienced by a typical survivor of the Hiroshima bomb was 200 mSv. Therefore 10 to 15 CT studies of the abdomen and pelvis are equivalent to the typical exposure of Hiroshima bomb survivor. Measured in chest x-rays, this is roughly 3,500 chest x-rays (each is about 0.06 mSv). not only in Japan but everywhere on the whole planet. without using any ionizing radiation. CT scans blast you with x-rays. Also, CT scanners do not always deliver predictable amounts of radiation. There was a recent finding by the FDA that some scanners inexplicably deliver up to 20 times the ordinary dose of x-rays. In these patients, the radiation dose was so high that the patients actually lost hair and might get early cataracts from a CTA (computerized axial tomography angiogram and perfusion study.) In most cases a CT study can be replaced by a 3T MRI study. Most physicians and patients are unaware of the huge dose of radiation that each CT scan delivers. Be aware. Always ask if there is a different test available that will not expose you needlessly to radiation. risk of cancer in patients with the proper genes by 600%. 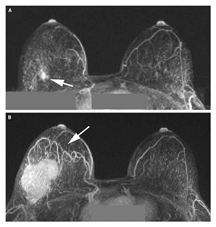 If you have the BRCA gene, like the patient shown above, the chance of developing breast cancer increases six times. Most women should avoid having unnecessary breast irradiation. This picture shows how much a breast cancer can grow in just one year in these patients. Women with a family history of breast cancer in two first degree relatives should consider BRCA1 and BRCA2 gene testing. This is covered by most insurances. Women who test positive for the BRCA1 or BRCA2 gene will know to stay away from CT scans and other sources of chest irradiation. Knowing if you have the breast cancer gene can change your behavior and save your life. 3T MRI IS 100% SENSITIVE TO BREAST CANCER. The pros and cons of CT scan. Almost the same study can be done without ionizing radiation by using an MRI scan instead of CT. It has similar sensitivity in the detection of cancer but uses no ionizing radiation. MRI also has a special sequence called diffusion weighted imaging—which detects cancers early. It REVEALs the cancer early. At MRI Consultants, we do this extra sequence for free when your doctor orders an MRI of the abdomen. Does yours? It only takes minutes. Early cancers are sometimes missed if this sequence isn’t used. Most university hospitals perform this additional sequence (for free). Sadly, many referring physicians do not even know what this is. In the body, it shows tumors of the GI tract and of the kidneys. We found two pancreatic cancers just last year. We found several patients with liver mets using this technique. In the past year alone, we diagnosed two kidney tumors based on their appearance on DWI. Given our commitment to quality patient care, we have been using REVEAL to pick-up early kidney and liver cancers since 2007. Despite the advantages of MRI, there are certain instances in which CT is the best diagnostic test. If you find yourself in this situation, be sure to ask for as low a dose of radiation as possible. It may involve calling around to different Imaging Centers, but getting a machine that uses the lowest dose of radiation is worth it. The CT scanner made by Siemens called DEFINITION FLASH is among the lowest dose CT scanners. More information on this and other MRI-related issues, check our websites: www.mriconsultants.net www.bestopenmri.net. For people without insurance, we offer a low Out-of-Pocket discount and for those who are truly claustrophobic, we offer free IV sedation. We try to make your MRI experience as low-stress as possible. Dr. Philip Chao graduated Phi Beta Kappa from Yale University and was Scholar of the House. He continued his studies at the University of Rochester School of Medicine and Dentistry, receiving his medical degree in 1983. After a transitional internship year at the Mary Imogene Bassett Hospital in Cooperstown NY, Dr. Chao did his residency in Radiology at Brooklyn’s SUNY Health Science Center (1984-1987), where he became Chief Resident. He stayed on to complete a fellowship in Neuroradiology (1987-1988). Dr. Chao has been interested in MRI technology since its very beginning – the first MRI scan took place in 1981 while he was pursuing his medical studies. The University of Pennsylvania, where Dr. Chao was both a Body MRI Fellow (1988-1990) and a Neuroradiology Fellow (1989-1990), was at the heart of the development of this technology and Dr. Chao was able to work with pioneers in MRI on the first GE Signa 1.5T (tesla) scanner. His advanced research and specializations complete, Dr. Chao left the University of Pennsylvania for a position as Director of MRI in Wilmington DE – a position he held for 14 years. Dr. Chao eventually left that position to create the best MRI center in Delaware, using the very latest technology: 3T MRI. While 3T (tesla) scanners have been used for scanning research patients since 2002, these advanced, more powerful MRI scanners only became available for clinical use in 2004. Dr. C hao worked hard to bring 3T technology to Delaware and in February 2007, MRI Consultants, LLC began operating the first 3T scanner in the State. 3T is the newest horizon for MRI.